Want to go about your day feeling grounded, less stressed, and more connected to what matters most in your life? This semester-long series of mindfulness-based, compassion-focused workshops is designed to inspire, recharge, and provide you with practical tools you can use in your everyday living and working for a greater sense of well-being. 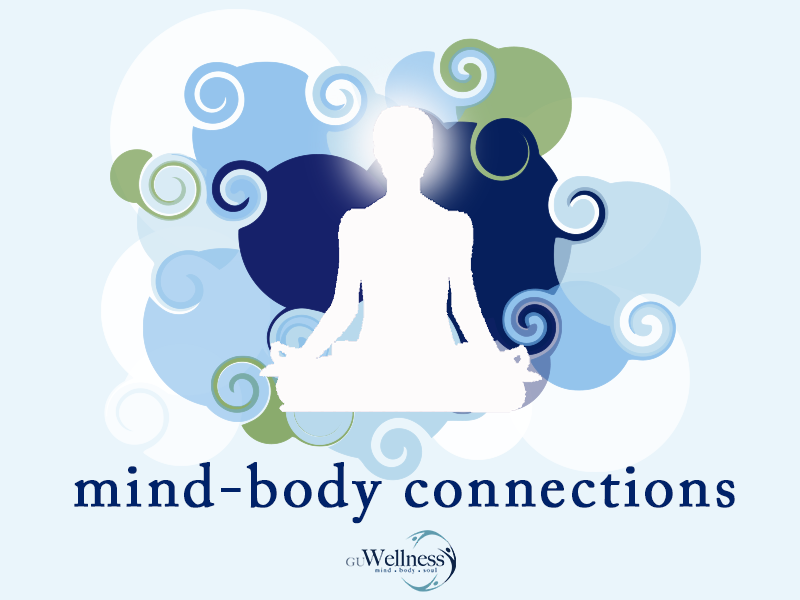 Over the years, Mind-Body Connections has become a monthly touchstone for many in our GU community. Our workshops are a time of pausing in our busy day to gather and be nourished. Throughout the years together, we have been about deepening insights and learning practices based on the latest research as well as ancient teachings in mindfulness and compassion that inform, nourish, heal, and inspire us at home and work. Together we are creating a more compassionate workplace and world. NEW format & semester-long experience! NEW! Two semester-long EXPERIENCES for you to make the Mind-Body Connection. Sign up for the fall and/or spring semester-long experiences. From September through December, we will meet on the 2nd Wednesday of each month for MBC Fall Semester. And then from January through May, we will meet on the 2nd Wednesday of each month for MBC Spring Semester. The most effective way to truly learn a skill, nourish your nervous system, and deepen your capacity to manage stress isn’t only to gather new information, but to also experience it. Our classes will be experiential in that your facilitator will guide you and your fellow classmates through a present-moment mindfulness, compassionate, and somatic practice in each class. The semester will be about working with and nourishing your nervous system so you live, work, lead, and love with clarity and calm. MBC Spring 2019 Semester: Is about your relationship with others at home and work. We will build upon what you experienced in MBC Fall Semester, and you will learn and experience mindfulness, compassionate, and somatic practices for your personal and professional relationships. We’ll explore your role as a parent/caretaker, partner, colleague, and leader. We’ll explore building mind-body skills for you to effectively interact, lead, and collaborate. Practices will include: present-parenting awareness, mindful leadership practices, Non-Violent Communication (NVC), and compassionate communication to support you in your various personal and professional roles. Introduction of the mind-body practice. Closing & inspired action for the month. Between classes, we will continue to offer support to help you continue to make the Mind-Body Connection through audio meditations and reflections, videos, and written inspirations. Taught by: Lisa McCrohan, MA, LCSW-C, SEP: Somatic Experiencing® Psychotherapist, Personal & Professional Development Coach, and Author. Come make the Mind-Body Connection! Sign up for the Fall Semester here. Sign up for the Spring Semester here. TIME: 1 – 2 pm.